So I’ve had a little bit of fun playing around with some apps for this piece. I’ve searched for the apps I believe can be of most benefit to travellers, especially for travellers with the religious needs of Muslims. Some of these have also been recommended to me by others, or come to my attention through my own recent travels. In an age where our smartphones assist us to organise so much of our lives, record many of our life experiences and provide us with important information, the use and development of apps for the travellers market is exciting to observe. I am so impressed with the team behind HHWT. The Singapore-based startup are real game changers, and have really opened up a lot of dialogue for Muslim travel enthusiasts to connect and share information. Their specialty is very much the halal tourism side of things, covering your basic needs as a Muslim tourist such as halal food, prayer spaces and they also do a great job of providing information on landmarks and attractions. The HHWT app reflects this focus, and aims to equip Muslim travellers with relevant information of their surroundings in order to facilitate islamically-compliant tourism. The app currently has travel guides for five cities, all in Asia. It gives you the option to “Create a trip” for a very practical planning feature of the app. The app also connects you to all the content of the site’s blog related to the featured cities in the app. I also like that it is interactive, as you can share your own or view other’s ratings. Although the app only features five locations at the moment, I envision great potential for the app, as the basic model is useful and user-friendly. As they build the bank of locations and functions of the app, I can see it being a big hit! The HalalTrip app is a product of the halal tourism website, HalalTrip. These guys are also major players in the Halal Tourism space, similar to HHWT and a very popular resource targeted mostly to the Southeast Asian Muslim travel market. The HalalTrip app is probably a little more versatile since it features a ‘Halal Food Spotter’, tour packages, in-flight prayer time calculator, handy travel duas and other Islamic information section as well as comprehensive travel guide documents for a few countries including Australia and Indonesia. This app is also interactive, where you can find a series of traveller reviews on mosques, restaurants and attractions, and even connectivity with the uber service in that location. Overall, this app is a great one-stop shop for Muslim travellers. Yet another socially interactive app (hey, the more apps, the better coverage!) for users to add and review restaurants and prayer spaces across 13 countries. It seems to have quite a lot of entries compared to other apps and has a pretty user-friendly interface. Have you ever wondered how to calculate your prayer times and the direction of the Qibla while on a flight? Well firstly, seek out learning the fiqh behind it, and then download this app! Sky Prayers works offline using the location information you input from plane entertainment screen information. It displays the shortest path to Mecca for you to determine the direction of the Qibla and also calculates the prayer times accordingly. The app also has the ability to detect location where GPS is enabled. It makes so much sense that Muslim app developers have created apps to assist Muslims with carrying out one of the most fundamental acts of worship, Hajj. The gurus who created HajjSalam are a Dubai-based startup, Hajjnet, who have received high acclaim in the Middle East for their mobile and web products. Upon opening this app, you are overwhelmed by how comprehensive it is. 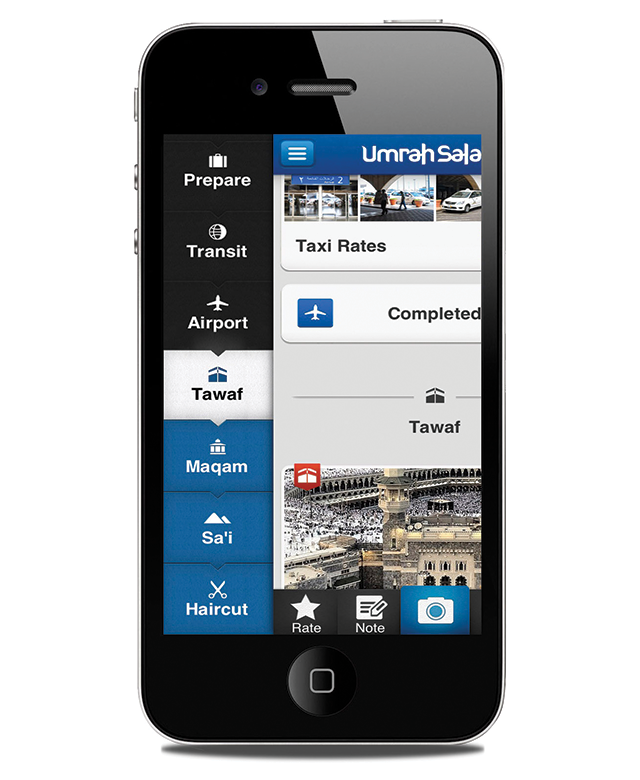 The app features a day by day explanatory guide for both Hajj and Umrah, including a checklist of activities to be completed. You can use it to read the relevant Hajj duas, keep count the amount of tawaf you have performed, have interactive maps at your fingertips to track the location of your companions, essential services and sites. The only thing I probably didn’t enjoy about this app was that it is sponsored by some ads. They’re not overly obnoxious ads, but it does kill the spiritual vibes a little. This is one of my most favourite apps in general, as it is useful for sending out cards for several different occassions. It does, however, most conveniently serve the purpose as a postcard delivery service while you’re globe-trotting! Remember those vintage things called postcards? Who even sends those anymore? If you’re in a location where finding a post office and postage stamps is too much of a mission, then use this online app to post one of your photos in the mail back home to your loved ones. A personalised message is included in their post card templates. It won’t have the local stamp from your location on it, but it really is the next best thing. My husband and I sent out customised postcards to our friends and families using SendOutCards on our recent travels, and it really was appreciated by our loved ones (still hanging on their fridges as proof!). I love that you can hand select photos you have taken yourself, and how easy it is to use from anywhere that has a wifi connection. I love the philosophy behind SendOutCards, to act immediately on a prompting when you’re instantly reminded of someone while traveling. The app connects with your phone contacts list, (so don’t forget to save postal addresses when entering new contacts!) is super easy to navigate and very affordable. This app was a lifesaver for us on a recent trip to Turkey and Iran. It’s a set of offline maps which also allows you to find your own location, navigate to and pin places of interest. It’s a quite detailed set of maps which is so much more convenient to use than paper maps or digital maps requiring internet connection. To search for some of the locations on this app, you may need to search using the language of that place, which may be hard if you are not too familiar with the script. Do you have any suggestions for useful travel apps especially for Muslims? Share in comments below!